Slurry landers that stand up to demanding conditions and last longer than traditional launders. One of the most efficient ways to transport any flowable liquid is in an open channel. When an open channel is carrying slurries and pulps, it is referred to as a launder. Corrosion Engineering has been manufacturing replaceable, maintainable, rubber and rubber/ceramic lining systems for slurry launders for more than 35 years. Our proprietary mounting systems and materials have saved literally millions of our customers’ dollars by reducing production interruption and lining costs when compared to alternative systems. Even greater savings and installation efficiency can be realized by having Corrosion Engineering fabricate the launder sections and install the lining system in our plant. The oldest and most common lining system for metallurgical plant launders is rubber. Some designers and end users vulcanize or glue calendered or vulcanized rubber sheet to the interior steel surface of the launder. This system works well until the rubber lining wears, exposing the steel underneath. Loss of the steel substrate is rapid, and the most common consequence is a hole in the launder. With this type of system, there are a limited number of options available, and the usual long-term solution is to replace the launder. Corrosion Engineering revolutionized launder lining by developing a design that incorporated replaceable rubber lining panels composed of wear-resistant rubber press-vulcanized to a steel substrate. Liners were purpose-designed for the floor and sidewalls. Attachment systems were developed that did not require penetrating the launder yet permitted rapid replacement of liner panels when they finally did wear to a point requiring replacement. These attachment systems, combined with Corrosion Engineering’s superior performing rubber compounds, are still the standard of the industry. As Corrosion Engineering perfected the incorporation of alumina ceramic (tiles and cubes) in a high-quality rubber matrix, a logical application was the most aggressive of slurry launder applications. Ceramic elements can be either CorroCube or CorroTile lining panels. CorroTile ceramic tile produces a hydraulically smooth surface that minimizes launder slope—an important consideration inside process plants. 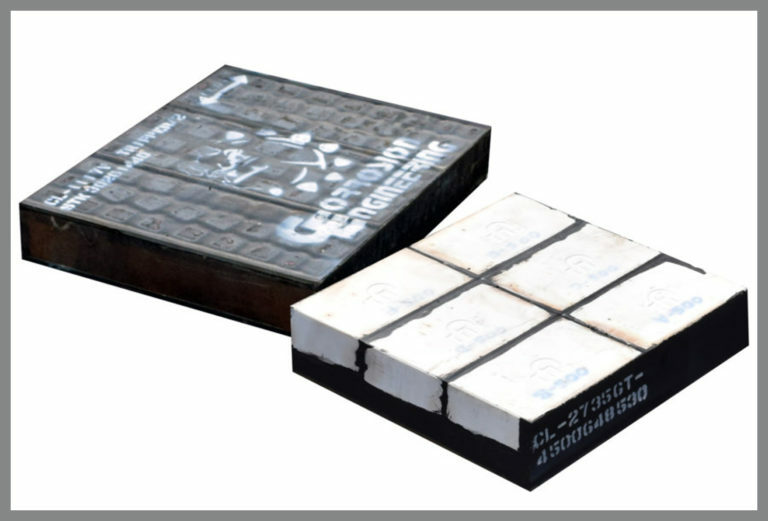 CorroCube ceramic cubes produce a robust, impact and wear-resistant surface for very aggressive and high energy systems. Corrosion Engineering has spent almost four decades perfecting the art and science of bonding rubber to alumina ceramic and steel. Our ceramic/rubber/steel composite launder lining systems are the standard of the industry and the go-to systems when others won’t perform.